The TradingView App (v.2.2.2) is the latest update of the TradingView App for iOS which natively supports both the iPhone and the iPad. TradingView announced that their Trading Platform was officially coming for the first time on a mobile device in 2017 and since then the popularity of the App has exploded becoming soon one of the most popular Apps for the iPhone and the iPad in the Finance category. Those new features add up to the already great set of functionalities offered within the app. The App comes with visually beautiful and intuitive charts – they outperform many Desktop Trading Platforms in terms of visual experience and ease of use. 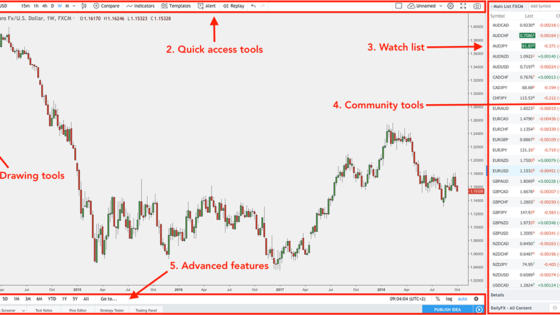 In addition to the most common Trading Indicators, you will find a wide range of drawing tools like Gann and Elliott Waves, to name a few, that will help you analyze the price action. In terms of assets, like on the Web Platform, you’ll be able to find stocks, currencies, cryptocurrencies, futures, CFDs and much more from exchanges in US, Europe, Asia and any other major exchange in the World. With more than 30.000 financial instruments from 40+ exchanges around the World, you’ll always be able to find the Chart that you’re looking for. Within the App, you will be able to create Multiple Watchlists and add as many symbols as you like to each of them. 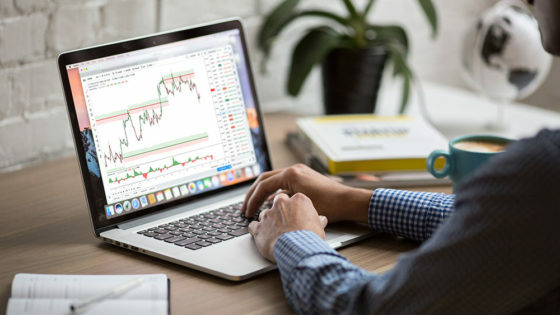 You’ll be able to always monitor your favourite currency pairs, cryptos or stocks and see price updates in real-time without missing any, even tiny, Market movement. The TradinView Platform now has several million daily users which publicly share ideas and opinions over the Markets. Within the App, you have the option to access the stream of ideas, follow Top Traders (by the way, be sure to follow our profile! ), comment, like and share your own opinions! All of this at the convenience of your fingertips. If thousands of ideas are not enough, you also have the option to discuss with fellow Traders about trades and the latest news in Public Chats, each one with its own main Topic like Binary Option Trading, EURUSD or even geographical communities like Australian Traders, French Traders and many more. Additionally, you can even send private messages for one-to-one trading conversations which will definitely help your Trading Experience to move to the next level. These are only the Key Features which are currently implemented into the TradingView App however, many more are being added with each update. So Alerts, Economic Calendar and a lot more should come soon. Not to mention the support for additional mobile devices like Android phones and tablets. The TradingView App for iPhone is available in the App Store for FREE and it seamlessly integrates with TradingView’s Upgraded Plans. 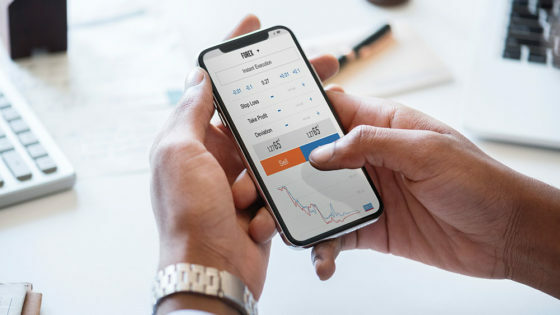 If you are an Active Trader and you need access to the Markets wherever you go, then be sure have the TradingView App on your device – you will never go without!